If you thought cleaning a dirty grill was not much fun, try cleaning up 19 grills. Whew boy. This took all afternoon. And most weren't really dirty but just have that pollen and red dirt so common in North Carolina. 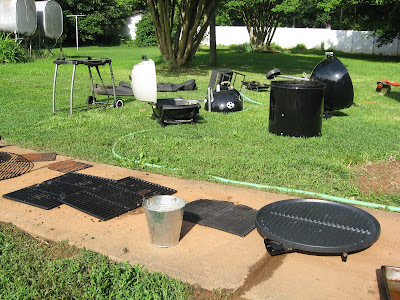 The sidewalk was covered with the grates, but the yard was littered with grills drying in the sun. A photographer is coming tomorrow from the local newspaper, The Salisbury Post, so I needed to get my grills looking sharp. The charcoal grills are always the most work, and I have a charcoal grill cleaning guide at my web site, Yes You Can Grill. I need to add one for gas grills, but they really are easier. 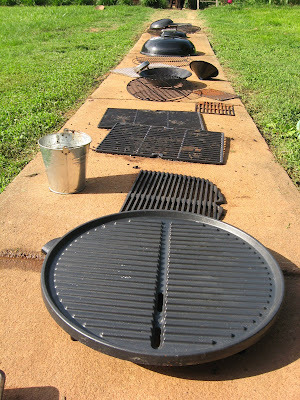 The main tip I would toss out is that you need to be careful with the grates especially if they have a finish. If you break the finish, then the metal under can rust. Heat the grates a little, and they wipe off pretty easy. Also watch for drip pans on grills that aren't charcoal. If you don't notice one and it fills up or sits, whew, that's bad news. You have gunk that can grow mold. Not pretty. Taking care of a grill of any type will greatly expand the life of the grill. If you don't have a garage or some place where the grill is really out of the weather, then be sure to get a cover. Lots easier to hose off a cover than a grill. And, it does add a lot of protection. I love your blog, but i was wondering if you could change the settings on your RSS feed so that the article shows up in my feedreader. Currently, the RSS feed only displays the title, and the content just says "This article does not provide any content." It would be a huge help to myself, and others too i'm sure. Thanks!